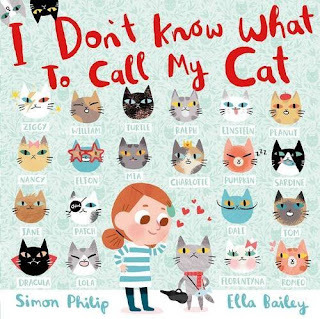 Simon Philip's brilliant "I Don't Know What to Call my Cat", with fantastic, fabulous illustrations by Ella Bailey, is a complete riot. It starts off as many a cat tail (sorry, tale!) does with a cat unceremoniously arriving on the doorstep ready to move in. The little girl in the story soon discovers that naming a cat isn't as easy as it sounds. Particularly when you make a huge assumption about whether it's a girl or boy kitty! This particular kitty is male, which just complicates things even more. Unceremoniously the moggy decides to do a bunk (another common cat trait) leaving the girl with little choice but to search for him high and low. Will her mystery missing moggy come back and save the day? There's tons and tons to love about this book, brilliantly observed and as cute as heck in places. Without a doubt though the cat (and we're desperately trying not to spoil anything about this one as it's so great - including the moggy's name of course!) Without a doubt though Charlotte's favourite bit about the book was seeing a beautiful princess moggy with her name on front and centre on the cover! "I Don't Know What to Call my Cat" by Simon Philip and Ella Bailey is out on 12th January 2017 so save up your Christmas money for it, it's MEOW-tastic!